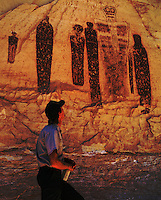 Rock art in the American Southwest can be found scattered across Arizona, New Mexico, Utah, Colorado and Mexico. Many ancient cultures left messages behind that speak of their lives, give directions, keep time, preach, threaten and, sometimes, delve into the world of the supernatural. Petroglyph or pictograph? 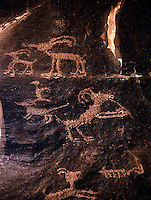 The first is carved into the rock, and the latter is painted on it.